We provide services for callus induction and initiation from your desired plant material. Costs are related to complexity, time and effort based on an hourly rate. The initiation of a callus culture from plant material may take 3 - 6 months. Along with the delivery of the callus, we provide the detailed protocol for the culture maintenance. 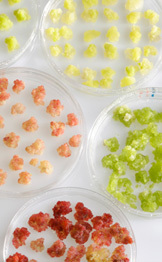 Plant cell suspension cultures can be initiated from a callus at VTT. Costs are related to complexity, time and effort based on an hourly rate. The initiation of a good suspension culture takes 8 - 16 weeks. Along with the delivery of the suspension culture, we provide the detailed protocol for the culture maintenance.